I am pleased to announce the appointment of Todd Early as the new Chair of First Responder Network Authority’s Public Safety Advisory Committee (PSAC). Todd has represented the National Council of Statewide Interoperability Coordinators (NCSWIC) on the PSAC since 2015. Since the start of his tenure, he has been incredibly active and dedicated, serving on the PSAC Executive Committee as the Tribal Working Group (TWG) liaison, leading the Early Builders Working Group (EBWG), and participating in multiple PSAC task teams. Todd replaces Interim PSAC Chair Paul Patrick, who was named to the First Responder Network Authority Board. He brings more than 25 years of professional experience in public safety to this leadership role. Many of us also know Todd as the Assistant Chief of the Law Enforcement Support Division for the Texas Department of Public Safety (State Police). Todd is responsible for all public safety communications statewide, and he is also the Governor-appointed State Point of Contact (SPOC) for Texas. Todd shares the FirstNet vision for collaboration and partnership, and brings a pragmatic focus to the needs of public safety. His position with the State Police enables him to experience firsthand the evolving challenges faced by public safety, and also see the opportunities that FirstNet can deliver. He brings passion and dedication to the job and to the FirstNet mission, and his expertise and hard work will benefit both the PSAC membership and the FirstNet Network. 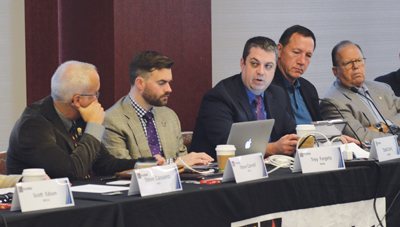 His vision for the PSAC will yield challenging work and new successes, as the collective expertise of this group and public safety is more necessary now than ever before. Together with the full Board and leadership, I look forward to working closely with the PSAC to ensure that public safety’s input, perspective, and needs guide our decisions and take the First Responder Network Authority to the next stage. We believe Todd will work with the PSAC membership to champion innovative approaches to ensure the PSAC’s input into the ultimate success of the FirstNet network that public safety advocated for. These discussions will officially commence at the next in-person PSAC meeting on Tuesday, December 11 in Tyson’s Corner, VA. Please join me in congratulating Todd on his appointment!